A view of a wind farm in 2010 in Velva, North Dakota. The US government on Tuesday approved a plan to build the country's first offshore wind farm, in a picturesque bay near Cape Cod, a popular Massachusetts holiday destination. The US government on Tuesday approved a plan to build the country's first offshore wind farm, in a picturesque bay near Cape Cod, a popular Massachusetts holiday destination. Installation of 130, 3.6-megawatt wind turbine generators with a total height of 440 feet (134 meters), built by German firm Siemens, could begin in Nantucket Sound by the autumn, the Department of the Interior said in a statement announcing that the Cape Wind Project was finally going ahead. The project, first put forward in 2001, has undergone "an unprecedented level of environmental and regulatory analysis," according to the plan approved by Bureau of Ocean Energy Management, Regulation and Enforcement (BOEMRE), part of the Interior Department. The US government only signed off on the project after "a thorough review of environmental impacts," said BOEMRE director Michael Bromwich. Interior Secretary Ken Salazar said "extraordinary steps" have been taken "to fully evaluate Cape Wind's potential impacts on environmental and cultural resources of Nantucket Sound." 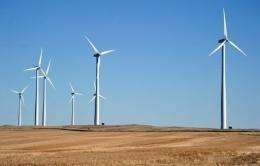 Once completed, the wind farm is expected to supply around three-quarters of the annual energy requirements of Cape Cod and the nearby islands of Martha's Vineyard and Nantucket, and cut carbon dioxide emissions in Massachusetts by more than 733,000 tons per year.